Who wants blue sneakers for their Poptropican? 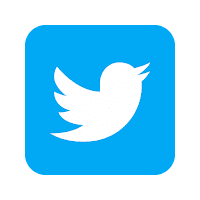 YOU DO! Oh man, I am having the toughest time beating Speedy Sam in this week's race on Poptropica! I keep slipping off rocks! This week's Feats of Speed racing game is race of endurance up Mocktropia Mountain. 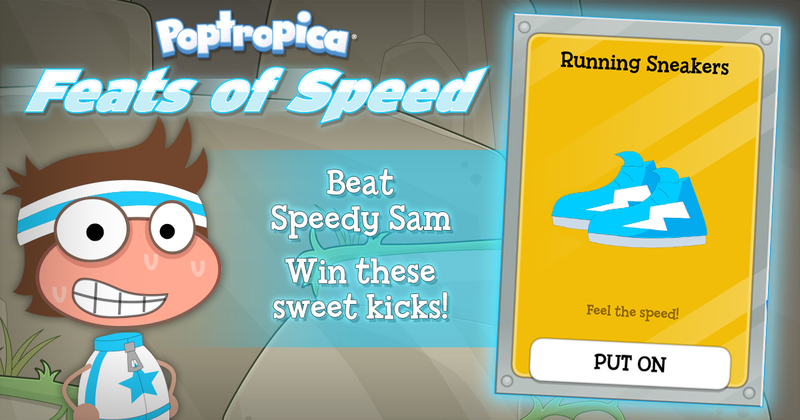 Beat Speedy Sam and the World Record, and you'll earn some awesome blue sneakers! I will beat you, Speedy Sam. I WILL. Last week's game of agility on Arabian Nights Island is now on the Poptropica app -- beat the world record and get maroon sneakers! Remember that these racing games are only available for a week or so. Once they're gone, you can't get those color sneakers again. 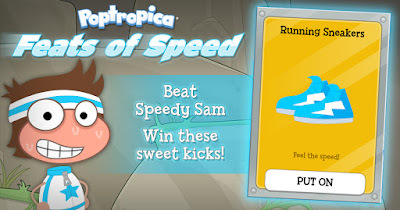 Go find Sam on his treadmill on the Home Island on Poptropica or on the Poptropica app now! Map, meet app. App, meet map. Poptropica is putting you on the map!